Mike Bedsole was an early adopter of cold rolled steel design and manufacture, and as one of Volstrukt's first cutomers, was the first tiny house builder to integrate a Volstrukt frame into a commercial THOW build. That frame is in here, so we had quite a bit of weight savings and we also gained a lot of strength. And that is what we were after. Mike Bedsole of Tiny House Chattanooga, introducing the Volstrukt lightweight steel frame inside the "Nooga Blue" model to Derek 'Deek' Diedrickson at the 2015 National Tiny House Jamboree. Last year's Jamboree display model, the "Nooga Blue" was built on a Volstrukt frame designed and assembled in Austin, TX. A year on, and one of the The Lookout's defining features was achieved by engineering the frame design to accommodate the array of window's (that inspired the model's name) without comprising the integrity of the structure. Mike Bedsole of Tiny House Chattanooga, the first commercial builder to use a Volstrukt engineered frame explaning the benefits of shifting to steel (L) and inside "The Lookout", with a Volstrukt frame inside and winner of Best-in-Show at the 2016 National Tiny House Jamboree (R). Jesse and Anca of Tiny Idahomes pride themselves on the passion that goes into every one of their tiny house builds. Earlier this year, the couple started working with Volstrukt's design team on a custom frame design for an upcoming project. They were happily surpised by the appeal of their (as yet unamed) model designed specifically to showcase in Coloardo Springs. First and second placed "Best-in-Show" tiny houses at the 2016 National Tiny House Jamboree by Tiny House Chattanooga (L) and Tiny Idahomes (R), Volstrukt's oldest and newest engineered lightweight steel frame customers. 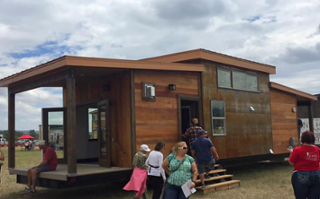 Greg Schnuur and Bill Skeele, Co-Founders of The Tiny Home Co did not have to travel far from their base in Colorado Springs to show off one of their three tiny home models at the Jamboree. "Mount Antero" was originally designed as a park model, but when looking at what needed to be modified to covert this house to be on wheels, Greg & Bill saw how a Volstrukt frame would increase structural integrity whilst reducing weight. The Tiny Home Co models were popular enough with future tiny homers to have the Mount Antero voted as number three of forty-eight tiny homes in the Best-in-Show rankings. 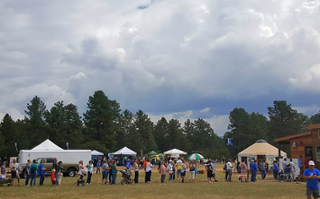 Long queues (L) waiting to check out Tiny Home Co's "Mount Antero" model (R), built on a custom Volstrukt lightweight steel frame and voted as the third most popular tiny home at the 2016 National Tiny House Jamboree. Tiny House Chattanooga, Tiny Idahomes and The Tiny Home Co are all commercial builders who have worked with Volstrukt to custom design frames to their own tiny home layouts. Commercial and self-builders can also start with one of Volstrukt's stock models of tiny house design, each with options for opening locations, trailer size and structural enhancements. Or, build one of the tiny house movement's collaborations with Volstrukt inside; such as the Cider Box from Shelter Wise, one of which we framed, erected and shipped from our base in Austin TX this week.